with the results of your collision repair. Since 1995, Telesis has steadily built our reputation in the Antelope Valley as your auto body repair experts. Your satisfaction is our number one priority. That’s why one call is all it takes to get started on your auto body repair claim. Receive personalized attention from neighborhood experts. We care and we want to make the process easy on you. 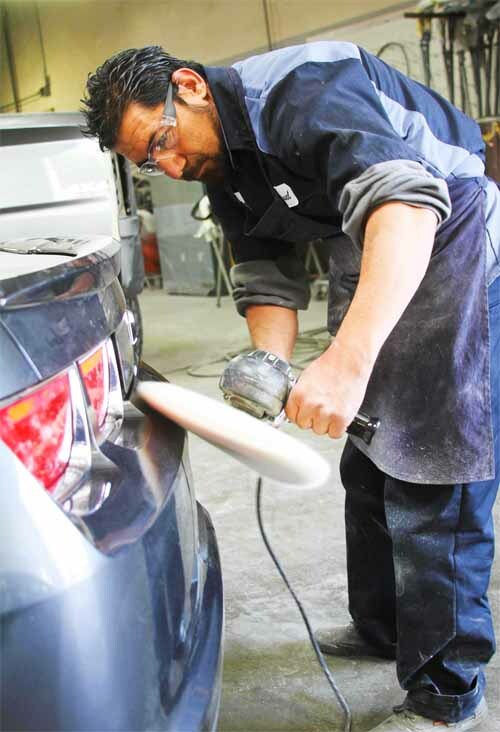 Telesis provides professional dent repair, frame repair and major auto body repair services. Protect the value of your auto investment and your safety. Choose the best. Choose Telesis Collision Center in Palmdale. As a certified I-CAR Gold Class Repair Facility, our team of well-trained auto body repair expert technicians and customer service agents strive to earn your business every day. Standardized repair processes, rigorous quality controls, a preference to use genuine OEM parts, and staying current with modern processes are just a few of the things we do in our commitment to quality and in being your automotive safety specialists. At Telesis, we are so confident in the quality and safety of our repairs that we offer a 100% Lifetime Warranty. Our warranty was rated “the best auto body shop warranty in the U.S.” by the Automotive Customer Relations Bureau. Telesis is locally owned and operated with a hands-on ownership approach that ensures superior customer care. We are licensed by the Bureau of Automotive Repair and the City of Palmdale. We are your auto body repair experts serving all of the Antelope Valley including Palmdale, Lancaster, Quartz Hill and Acton.